Fairytale Christmas tree with snowing embroidered on Christmas red or gray back ground. Matching placemats, napkins and table runner available. Made with 100% wrinkle and stain resistant easy care poliviscose. Machine Washable. 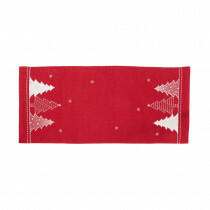 Christmas dinner will be perfectly accented with these warm and inviting holiday linens.